The Patriots have had hundreds of wins under the Tom Brady regime over the past 17 years, but there are a few that stick out as the best of the best. To get you excited for the 2018 NFL season, here are the top five Patriots games of the Tom Brady era. Rodney Harrison seals the deal with his late interception in Super Bowl XXXIX. With a win over Andy Reid and the Philadelphia Eagles in, Super Bowl XXXIX, the Patriots secured their spot as the first and only dynasty of the 21st century. Tom Brady was able to lead New England to their 3rd championship in four seasons, officially cementing the Patriots as an all-time great team. The game featured an outstanding performance from wide receiver Deion Branch, snatching a possible third Super Bowl MVP away from Tom Brady. The scene is a snowy January night at the last ever game in the old Foxboro Stadium. The divisional playoff game known as the “Snow Bowl” was the first playoff game under Tom Brady as the starting quarterback. This game featured the infamous “Tuck Rule”, the play that gave the Patriots another chance to tie the game and thus go on to create a dynasty in their first Super Bowl win ever just weeks later. If not for this game, the dynasty may have not ever came to be, or at least would’ve been put on hold for another year. The first brick of the Patriots Dynasty was laid with their Super Bowl XXXVI victory. The two touchdown underdog New England Patriots and Tom Brady were faced with the challenge of beating “The Greatest Show on Turf” in the St. Louis Rams. The Patriots jumped out to a 17-3 lead, only to have the game be tied at 17-17 late in the game. It took a historic drive led by Tom Brady to set up Adam Vinatieri for the heroic game winning field goal. The Patriots won the game 20-17 and were on their way to creating a dynasty for years to come. Super Bowl XLIX was perhaps the most important Super Bowl for Tom Brady and the Patriots in the 2010s decade. Tom Brady, previously 3-0 in Super Bowls, was now 3-2 after two devastating loses to the underdog New York Giants. A third Super Bowl loss in a row would seemingly keep him off the mountain as the top quarterback above Joe Montana. Down 24-14 in the 4th quarter, Tom Brady orchestrated two drives that finished with touchdown passes to Danny Amendola and Julian Edelman. It was undrafted rookie cornerback Malcom Butler that sealed the victory with his immaculate goal line interception with under a minute to go. Tom Brady was now 4-2 in Super Bowls and had cemented his legacy as the most successful quarterback of all time. Super Bowl LI featured the most historic comeback in Super Bowl history and allowed Tom Brady to capture his record fifth ring. The Falcons held a commanding 28-3 lead over the Patriots late into the 3rd quarter, but an Brady never quit. It took a Dont’a Hightower strip sack and an outstanding Julian Edelman catch in the 4th quarter, but the Patriots were able to tie the game at 28-28 at the end of regulation. An impeccable overtime drive orchestrated by Brady left no doubt in people’s minds that he was the best to ever do it. James White scored the touchdown that capped the greatest comeback ever, winning the game for New England 34-28. 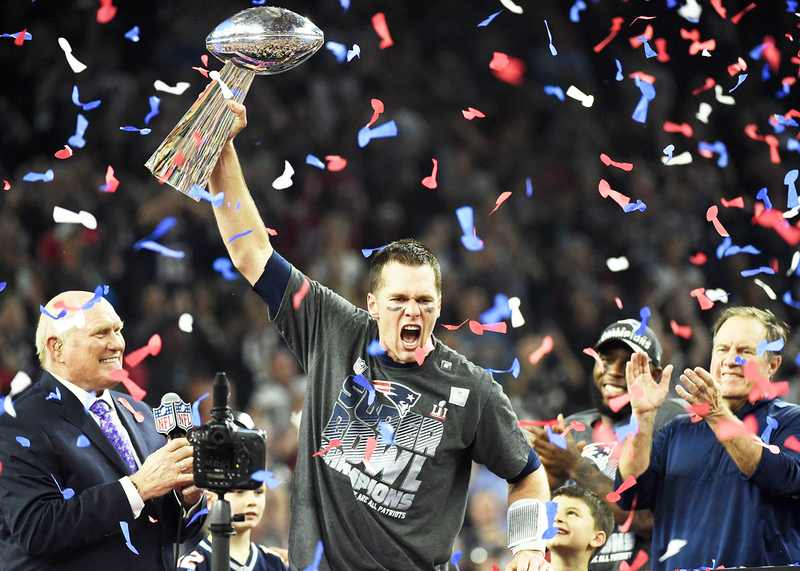 Tom Brady now had five rings, and was considered the greatest quarterback of all-time.